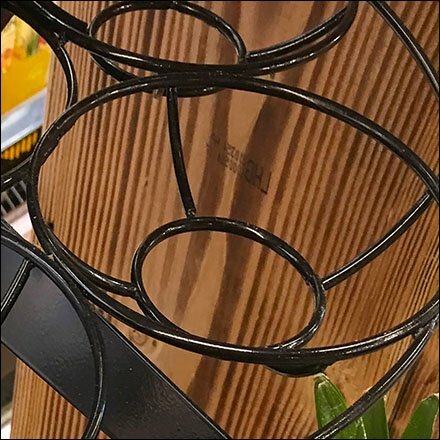 Not one, but two concentric cross-braced rings provide support for fresh Pineapple merchandising by this Fresh Pineapple Open Wire Ring Hook. The twin rings allow individual Pineapples to nest and seat solidly in place, yet lift right out for inspection or purchase. The rings are permanently mounted, because after all, in a single product display like this there is never any need for replanogramming. See Fresh Pineapple Open Wire Ring Hook Details in the feature and inset images. Ring Hooks offer Product Frontwires configured with circular components. They are useful in the display go balls as well as creating quivers for containers or presentation of loose items. Ring Hooks are always metal in construction, though they may attach via Plastic Backplates in 2-piece designs.